Click on the logo go to our home page to see all of our products! If you are looking for even higher-end faucet for your custom kitchen, we offer the Euro Designer Series. This faucet is forged from lead-free brass* and features a ceramic disc valve for long life and controlled flow. It is available in CHROME, BRUSHED NICKEL, FLAT CHROME, ANTIQUE WINE, AND ANTIQUE BRASS. It is 11" tall and has a swivel spout with a reach of 6". This gracefully designed faucet adds only $39 to the cost of our under counter water filters. Click HERE for more detailed picture. Our Euro Series faucets may be purchased outright for $69.00 if you wish to upgrade your existing system! Includes quick-connect fitting for 1/4" or 3/8" tubing. Select your color in the shopping cart. And if you want the ULTIMATE in designer faucets, consider the Tomlinson line of faucets. 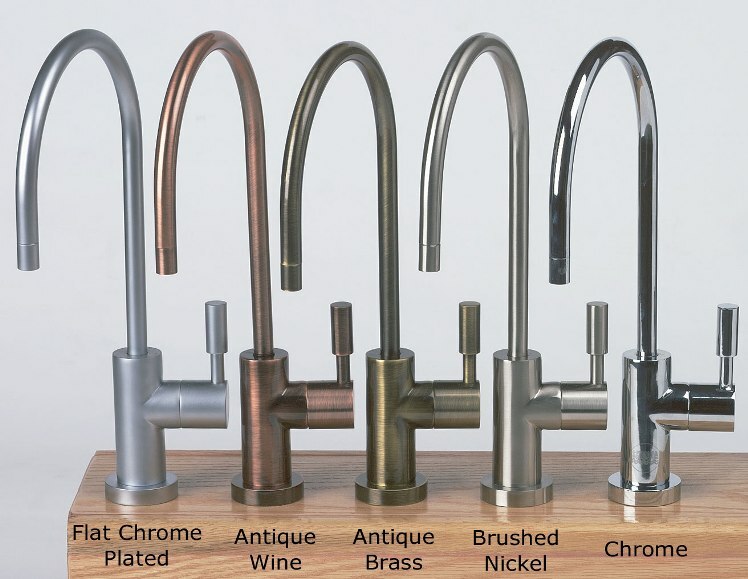 These are the highest quality and highest styled faucets on the market! Made in the U. S. from lead-free* brass, it features a smooth-operating ceramic turn handle. It stands 12" tall and has a swivel spout with a no-drip tip and a 5.2" reach. It is available in CHROME, SATIN NICKEL, WHITE, BISCUIT, POLISHED BRASS, ANTIQUE BRONZE, BLACK, AND BRIGHT NICKEL (click HERE for picture). This exquisite faucet adds only $99 to the cost of our under counter filters. Our Tomlinson Designer Series faucets may be purchased outright for $129.00 if you wish to upgrade your existing system! Includes quick-connect fitting for 1/4" or 3/8" tubing. Select your color in the shopping cart. Our premium series faucets may be purchased separately for $39.00 if you wish to upgrade your existing system! Includes quick-connect fitting for 1/4" or 3/8" tubing. Select your color in the shopping cart.